I heard about you in an episode of 'The Apprentice' where I saw the product and thought it was a fabulous idea. My daughter is just starting to crawl and my main worry was about her bumping her head or falling on it. I have also read good reviews about it from people who have already bought it. So thank you in advance for the product and making sure I don't have to worry when my daughter is throwing herself around the living room!!! Whilst seeing our baby boy fall over for the umpteenth time (after starting to walk over the last 3 weeks), I decided that he needed a bit more protection than our hands and our medium carpet. I was dreaming up all kinds of ideas thinking that nothing like this exists (never saw anything similar in Mothercare), and wondering why nobody else had already invented / made a baby crash helmet that a baby would not find impeding. That's when I spent time googling "baby head protection" before stumbling on your website. The rest is self explanatory! I just wanted to comment that, recently our 15 month old was playing outside in the parking area, trying to follow our 4 yr-old around. She fell forward and caught herself with her hands, sat on her bum, then jerked back and hit her head on the cement. She had a 10 minute long seizure from the trauma (so they THINK). It was the most traumatizing experience we've ever had. Between my husband and I, I've always been very loose at 'letting the kids go and experience being a kid'. But after having my 19lb daughter convulsing, with her eyes rolling back and foaming at the mouth, while in my arms for 8.5 mins before the ambulance arrived. I think this is a much NEEDED PRODUCT. I can honestly admit, I was one of those people that thought parents were just being over-protective. But now I really think it's just being cautious. I would not wish the experience upon anyone. I would have rather gone the rest of my life being care-free from the fear that it could happen again. I ran a web search for "infant crash helmet" when our 7 month old twins became mobile enough to smack their noggins, a sure sign that worse was yet to come. In contrast, my wife wanted to put gates and padding everywhere in the house making it look like a scene from "One Flew Over the Cuckoo's Nest." After sifting through the results of my search I found Thudguard and showed it to my wife. Her reply was, "Helmets are only for children with special needs - I don't want people thinking that about our children..." Well, a few days later both girls bumped their heads pretty good. My wife had a change of heart, and told me to place the order immediately. We'll still have a few safety gates and use the playpen, but I'm hoping for a happy medium. By the way, I think they're cute! I would just like to say another big thank you and Happy Christmas and New Year to Kelly Forsyth-Gibson and all the other people who helped invent the Thudguard. It has made all our lives so much easier and better but especially for our little girl Coco who wears it all the time. It has been so much safer for her and gives her so much freedom to explore. I know already she would have been in the hospital without it more than once. The Thudguard should be compulsory like a seatbelt. Maybe one day. Please all take care, Margaret Egan and family. Hi There I am a customer ...I recently purchased a Thudguard baby head gear for my 7 month year old and it really saves the day. I am very happy you have such a product out. I saw "tipntrends" in Parent's magazine last night. I got a Thudguard for my grandbaby 8 months old and one for demonstrations when I go into grade schools doing helmet education programs. Great little invention! We were so happy when we found Thudguard, it was the answer we were looking for when trying to safeguard our son while he was first learning to toddle and walk. As a haemophiliac our worst fear was any internal bleed in his head and we felt that your product provided the protection we were looking for that would allow our son to simply be just another little boy at the playground and day-care. One of the best aspects of the product is that while it provided all the protection we could hope to give him, well short of never letting him out of the crib, it was not bulky or boring in design. We could tell the time that was put into designing the product and the attention that was given to all its features, even the one size fits all truly was one size fits all, despite being nearly two years old he could wear his helmet today even though he got it when he was 9 months old. A good friend had a Thudguard for her son and I am visiting family in Spain where all the floors are Marble, so the Thudguard was perfect. My first born is worth more than life to me and I want to protect her from the start and not look back and say, "Well, if I only would have bought that Head-Guard she wouldn't have hurt her head when she fell over". I am writing from Fernie, Canada. I have purchased your helmet for my son who is 10 months. He is my fourth child. When our first was born, we found a similar kind of helmet. However, it does not protect as well as the Thudguard. Thank you to the inventor for caring about her child enough to go so far as creating a helmet that works. I saw information on Thudguard in Parenting Magazine on the new trends page- then I checked out the website and placed an order. We absolutely love the Thudguard for our 9 month old daughter. We have tile floors throughout our house and some sharp corners on furniture as well as lots of glass doors and windows - our daughter is standing up now and will soon be taking her first steps so the protection for her head is much needed. My husband is an Emergency Medicine trained physician and he knows too well the damage that a head trauma can cause in young babies and children. So thank you for this wonderful product. We have been using it for a couple weeks now and love it! Happy customer, USA. We saw Thudguard on The Apprentice and as our son is now 9 months he is trying to walk and is constantly covered in bruises so enough is enough and we placed the order! I purchased a Thudguard Helmet from you in June this year to be sent to my grandson Timothy in Hong Kong. I am currently with my son in Hong Kong and thought you might be interested in seeing a picture of Timothy in the helmet, I think he looks gorgeous. 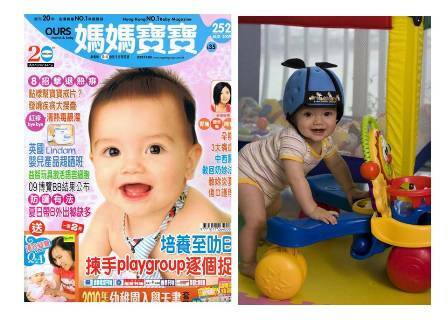 I am naturally an extremely proud nanny and have taken the liberty of also attaching a picture of Timothy on the front cover of a Hong Kong magazine, he has just won the competition face of Hong Kong's "17th International Baby/Children's Products Expo"